In my previous blog, “Amplify Your Return on Data,” I talked about how big data and analytics have transformed data from a business byproduct to a monetization opportunity. I also outlined a three-point approach to get that data into the hands of your data innovators – the people in your organization who can use it to better understand your market and your products to create more revenue. 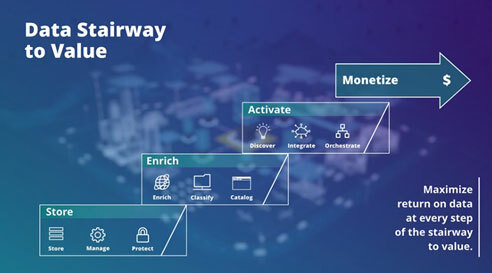 Building on that three-point strategy, Hitachi Vantara has developed the Data Stairway to Value, a framework for success that can help you acquire data value at every step to get the most return on your data. The Data Stairway to Value aligns your investments to deliver the return you’re looking for from your products. It reinforces the integrated nature of all of your investments – and it’s a system that pays off at each level. Let’s take a deeper dive into these four steps. You need to capture and store as much data as you can at the lowest cost, at the right service levels and at the right location across your edge, private, hybrid and multicloud environments. With the amount of generated data growing at an astounding rate, that may sound like a herculean task. But with an agile data infrastructure that optimizes the storage, management and protection of your information assets while optimizing your service levels, you can enable innovation across your enterprise. Once storage is optimized, you can enrich your data by applying metadata to classify and catalog it, providing context for intelligent data management and governance. You can link this data to discover conceptual relationships that are otherwise invisible and apply those insights to support the innovations that drive value for your business. Enriched data facilitates good governance. Why is governance so vital? In today’s increasingly regulated environment, you need a reliable way to handle legal compliance frameworks. For example, if you have a globally distributed employee base with differing access policies across regions, the burden on your IT operations is significant. Agile data governance allows you to understand what information is available, where it is, who can access it and what policies must be followed to avoid risk to your business. By activating your data, your company will ultimately realize the biggest value. In this step, you discover, integrate and orchestrate data to drive business value, either by boosting productivity or creating new revenue opportunities. Activating your data enables you to apply advanced analytics that generate actionable insights for every enterprise interaction and application. For example, now that you understand how your data is related, you can create a predictive algorithm that sends an alert to a maintenance worker when a predefined condition is detected. With that real-time insight, the worker can take action before equipment breaks down rather than having to react after the fact, which can be costly – According to the U.S. Department of Energy, predictive maintenance could reduce maintenance costs by 25%-35% while also decreasing breakdowns by 70%-75% and reducing downtime by 35%-45%. Businesses can also use that insight to create an algorithm on customer data that alerts customer service to certain types of behavior. With this information teams can take action that reflects each customer’s preferences, which ultimately will delight them and drive them to do more business with you. Although the first three steps also provide economic value, this step creates completely new business opportunities from your data. Monetizing your data is about taking its latent value and connecting that value to an entirely new customer. For example, an elevator manufacturer could analyze the ridership data it collects from its elevators in a shopping mall. That data is valuable to the shopping mall operators – They can use it to quantify the flow of people through their mall to help them optimize factors such as retail rents for different spaces. The Data Stairway to Value prioritizes your ability to maximize your return on data at every step. You don’t have to go through all of the steps before you see the value but keep in mind that each level enables the success of the level above it. With this framework, Hitachi Vantara can help you attain outcomes that capture the full economic value of your data inside your enterprise and beyond as you put more and more of your data to work in your digital transformation.